I believe that we get into trouble when knowing becomes a surrogate for learning. We know that a vast recall of facts about something is in no way a measure of understanding them. At best, it is necessary but not sufficient. And yet we subject our kids to memorizing. We seem to believe that rote learning is akin to physical exercise, good for their minds. And, quite conveniently, we can test whether the facts stuck, like spaghetti to a wall. In some cases knowledge is so drilled in that you know and hate a subject at the same time. The closest I have ever come to thinking about thinking is writing computer programs. This involves teasing apart a process into constituent parts, step-by-step functions, and conditional statements. What is so important about computer programs is that they (almost) never work the first time. Since they do something (versus nothing), just not what you wanted, you can look at the (mis)behavior to debug and change your code. This iterative process, so common in computer programming, is similar to learning. One Laptop per Child (OLPC), a non-profit association that I founded, launched the so-called XO Laptop in 2005 with built-in programming languages. There are 2.5 million XOs in the hand of kids today in 40 countries, with 25 languages in use. In Uruguay, where all 400,000 kids have an XO laptop, knowing how to program is required in schools. Estonia just did the same. 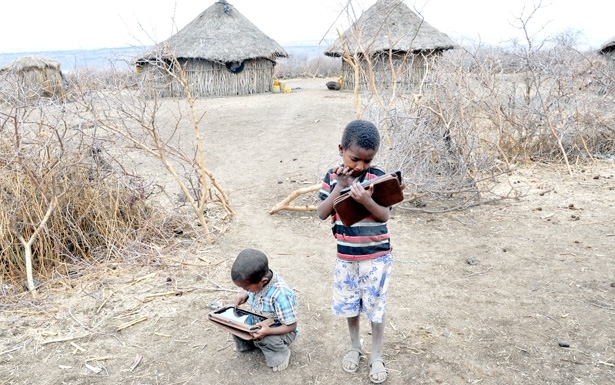 In Ethiopia, 5,000 kids are writing computer programs in the language Squeak. OLPC represents about $1 billion in sales and deployment worldwide since 2005—it’s bigger than most people think. What have we learned? We learned that kids learn a great deal by themselves. The question is, how much? To answer that question, we have now turned our attention to the 100 million kids worldwide who do not go to first grade. Most of them do not go because there is no school, there are no literate adults in their village, and there is little promise of that changing soon. My colleagues and I have started an experiment in two such villages, asking a simple question: Can children learn how to read on their own? If you want to learn more about this research, read the original post here. A new batch of photos of the XO-3 in use is up on the posted on the OLPC wiki, along with images of the alpha test boards and schematics. Nothing like a little transparency to start the week off right… This is still not the final ID, there are still changes being made to the ports and cover, but we’re getting verrry close. Rob McCrae, ICT Director for Auckland’s Diocesan School for Girls, shares a conversation he had with parents at his school about why laptops are a fundamental platform for children learning. Via Scott McLeod. What has become important is the “just in time” model. A model which sees essential habits and attitudes of learning being the focus. A model which sees the ability to think about our own thinking as a focus.